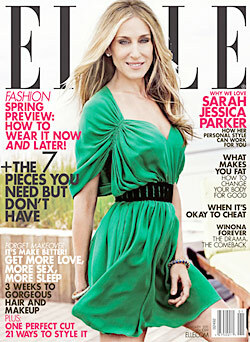 The ever classy Sarah Jessica Parker has landed the January cover of Elle USA. The president of Halston Heritage is wearing of course a dress from the Halston Heritage Line and is looking damn good. I must say Elle USA recent covers have been pretty bland and boring, but I actually like this cover, though the digital editing on SJP's hair on the cover is tres amateur. Ah well we can't have it all.